The Greeks are now in a so-called four-month breathing space, an extension of the existing ‘bailout’ programme agreed by the previous Conservative-led government with the Troika (the EU Commission, the ECB and the IMF). Of course, this breathing space is already narrow and closing. The Greek economy continues to suffocate (see my post https://thenextrecession.wordpress.com/2015/03/03/greece-breaking-illusions/). But there is an opportunity to consider the way out for the Greek people when the four months are up. That’s what makes the recent interview in Jacobin with Syriza MP and Marxist economist, Costas Lapavitsas, a leading member of the Left Platform within Syriza, so interesting. (https://www.jacobinmag.com/2015/03/lapavitsas-varoufakis-grexit-syriza/). Costas pulls no punches and spells it out like he sees it, taking no prisoners from the reformist left as represented by current finance minister Yanis Varoufakis or what he calls the ‘ultra-left’ of the KKE communists and Antarsya (as well as unnamed impractical Marxists). Previously based at the SOAS college in London, Lapavitsas is not a member of Syriza (although he was elected on the party list) and is a newcomer to parliamentary politics. However, he has been a socialist activist for most of his life and is known for his incisive and challenging theoretical work on the political economy of money, credit and financialization (see my post, https://thenextrecession.wordpress.com/2013/11/12/the-informal-empire-finance-and-the-mono-cause-of-the-anglo-saxons/). Lapavitsas has also worked with the Research on Money and Finance group in London to produce concrete analyses of the origins and trajectory of the European crisis and, most recently, published together with the German neo-Keynesian economist Heiner Flassbeck a kind of manifesto proposing a radical break from the euro. It’s a long and thorough interview, excellently conducted by Sebastian Budgen, so I’ll just concentrate my comments on what I thought was key to understanding the state of the Greek capitalist economy and the policy objectives and alternatives open to Syriza and the Greek people. This post is still very long! Lapavitsas is right to say that whether we consider Varoufakis a Marxist or not is unimportant (at this point in the interview, reference is made to my own analysis of Varoufakis’ views – see my post, https://thenextrecession.wordpress.com/2015/02/10/yanis-varoufakis-more-erratic-than-marxist/. As Lapavitsas, puts it, Varoufakis is a heterodox economist who has rightly “rejected neoclassical economics”, but he has never been “a man of the Left, revolutionary left” and was at one time an adviser to reformist George Papandreou. Lapavitsas is right on this: labels are not important: the correct analysis and policy prescriptions are what matters. And what is clear is that Varoufakis owes more to Keynes than Marx. I find that surprising coming from a Marxist. The Syriza government now has the opportunity to campaign among the Greek people and implement socialist measures to replace Greek ‘big capital’ with a domestic economy controlled by the common weal. Instead, it seems both the wings of Syriza want to adopt Keynesian solutions (only); except one wing wants to do it within the euro (Tsipras/Varoufakis), while the other says that is impossible and wants to do it outside the euro (Left Platform). Now I’m not opposed to using Keynesian prescriptions as part of any socialist measures for Greece: e.g. progressive taxation, government spending, labour rights, minimum wage (not sure the latter are even Keynesian). But such measures must be part of a programme to replace capitalism, not try to make it work – in or out of the euro. Lapavitsas is clear about his alternative: “the obvious solution for Greece right now, when I look at it as a political economist, the optimal solution, would be a negotiated exit. Not necessarily a contested exit, but a negotiated exit.” This would involve a 50% write-off the debt owed to the EU and protection of the new Greek currency (devalued by just 20%) with liquidity from the ECB. Lapavitsas reckons that this policy might even get support from Germans wanting to get rid of Greece from the Eurozone. As he says: “Schäuble is on record, or at least Greek ministers are on record, stating that Schäuble offered an aided exit to the Greeks already back in 2011. I can see, from the perspective of the German power structure, why they might be tempted by this idea” And the IMF probably would support a debt restructuring. Devaluation would not have to be more than 20% because Greek labour costs have dropped so much already. Well, I’m not convinced. In a joint paper with G Carchedi we showed that the recovery in real incomes in Argentina after the 2001 crisis was more to do with the debt default and the recovery in profitability of Argentine capital (see pp 108-9, The long roots of the present crisis). And the apparent success of the Argentine case was shortlived at best (see my post, https://thenextrecession.wordpress.com/2014/02/03/argentina-paul-krugman-and-the-great-recession/). The breathing space created for Argentina by breaking the dollar peg does not seem to have restored the Argentine economy to stable growth. After a few years of a commodity-export led boom, the Argentine economy is back in crisis, despite Keynesian policies adopted by the government. There has been a 6% fall in per capita GDP since 2011. Even if the Troika were to agree to such a ‘negotiated exit’, which is a moot point; and even if the new Greek drachma only depreciated by 20% (extremely unlikely), the Greek economy would still be on its knees, unable to restore living standards for the majority. Devaluation and rising prices would eat into any gains made from cheaper exports. Lapavitsas seems to recognise this: “Wages must rise, but even if they rise, you’re not going to go back to where you were. It’s just not feasible at the moment. We need a growth strategy for that.” Exactly. So why stop there? Why not propose the replacement of ‘big capital’ with public ownership and workers control and a plan for growth? Apparently, that is something for the future, the medium-term, not now. “I am very skeptical, though, about this in the context of Greece right now… These are medium-term questions. These are questions that one should knuckle down and begin to confront once the problem of debt, fiscal pressure, and the monetary union have been resolved.” But can the latter be resolved without the former? This last sentence is key for me (that’s why I have emboldened it). If I were Costas, I’d be advocating within Syria now for just such a broad and wide programme to replace capitalism. For me, the Marxist analysis of Greek capitalism leads to the policy prescription for its replacement now, in or out of the euro. But for Costas, a Marxist analysis is fine, but the policy prescriptions should be Keynesian – because the latter is more practical? And yet Lapavitsas recognises in the interview at one point that the problem for the Greek economy has not been being in the euro as such but the weakness of Greek capitalism, translated into its lack of competitiveness: “the emphasis on the service sector means that Greece has become uncompetitive internationally because services are well-known for being not particularly competitive”. 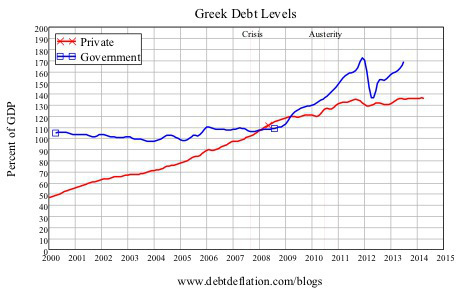 She goes on: “Greece’s debt overhang seriously impedes recovery, But it is not just public sector debt. The real problem is that both the public AND private sectors are over-indebted.” Post-Keynesian economist Steve Keen has recently pointed out, “While Greece certainly had its own specific problems—especially with its current account—in general, its apparent boom before the crisis and the crisis itself had much the same cause as in the rest of the OECD: a private debt bubble that burst in 2008. Private debt grew rapidly before the crisis—on average by more than 10% of GDP per year.” Since during that time the government deficit did not grow, the private sector deficit was funded by external capital inflows. In other words, the private sector borrowed from foreigners to fund domestic investment spending, resulting in a worsening external balance. Greek capitalism failed. It failed to invest, particularly in the productive sectors of the economy. 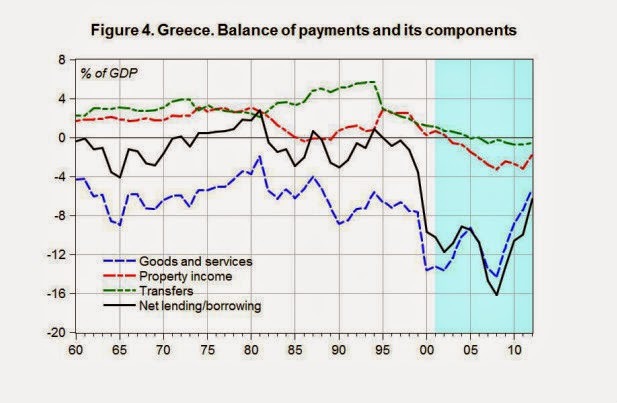 Foreign investment and capital dominated the Greek economy and left Greece in the lurch at the first sign of trouble (see the paper by Stavros Mavroudeas, 2015_001-libre). Can we explain and measure that weakness? 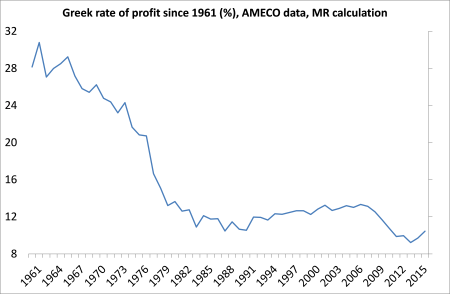 Well, the Marxist way is look at the movement and level of Greek corporate profitability. This has been abysmal. And along with it, comes the low level of investment in productive sectors of the economy. Greek economic growth prior to the Great Recession was increasingly founded on speculation in property and construction, and on relying on foreign investment and euro subsidies. The ultimate cause of the Greek crisis was falling and low profitability and the proximate cause was the huge increase in fictitious capital to compensate that eventually imploded in the Great Recession. It’s a shame that we ‘second rate’ Marxist economists with no training in monetary theory and who don’t understand money and finance (this cannot apply to me, I think, as I have worked in investment banking for 30 years – but maybe) fail to see that the problem for Greece is not its weak capitalist economy and its lack of profitability and investment. The problem is monetary union and the euro. Actually, there is a lot of evidence that Greece’s heavy dependence on small businesses has kept its productivity and investment low. But nobody should be opposed to supporting small businesses and Marxist economics does not imply that the government should nationalise everything that moves. But why draw back from taking over the ‘commanding heights’ of the economy and the oligarchs that own them? The Keynesian ‘multiplier’, supposedly a measure of the likely boost to growth and incomes from public spending, does not work unless profitability is restored, as Carchedi and I have shown in our paper on the ‘Marxist multiplier’ (https://thenextrecession.wordpress.com/2012/06/13/keynes-the-profits-equation-and-the-marxist-multiplier/.) So should Greeks wait until Keynesian policies have ‘generated the capital and savings’ for the ‘medium-term’ socialist strategy. Yet, as Lapavitsas says “there are vast unused resources in Greece. Capital is not short in that regard. Capital has far more than cash in the bank. We have to think as Marxists here. Capital is a relation. There are vast unused resources across the country!” Yes, so a domestic plan for investment and growth based on the public ownership of big capital and integration of the banking sector and the major industries of shipping, pharma, agriculture etc could utilise these wasted resources of skilled labour and finance. I’m not sure which ‘Left’ Costas is referring too here. But Marxist economics agrees that the EU and EMU do not offer real internationalism for labour. These are organs of capital, especially big capital; and they have exacerbated the uneven development of capitalism in Europe (see my unpublished paper, Euro crisis is a crisis of capitalism). That said, Greek capitalism is no position to turn things round with its own currency. Greek capital will be saddled with huge euro debts following devaluation and it won’t be able to export enough to stop the Greek economy dropping (further) into an abyss and taking its people with it. Grexit also means not just leaving the euro but also the EU and without any reciprocal trade arrangements that Switzerland has, for example. Costas Lapavitsas and Yanis Varoufakis are economists who have become politicians and are now in the frontline of the fight by Syriza to restore the living standards and rights of the Greek people in the face of an onslaught from European capital. It ain’t easy – it’s certainly easier to criticise from well behind the lines. But if they read this, I hope they take it in the spirit of best intentions. The issue for Syriza and the Greek labour movement in June is not whether to break with the euro as such, but to break with capitalist policies and implement socialist measures to reverse austerity and launch a pan-European campaign for change. This entry was posted on March 14, 2015 at 10:49 am and is filed under capitalism, economics, marxism, Profitability. You can follow any responses to this entry through the RSS 2.0 feed. You can leave a response, or trackback from your own site. Good stuff! Just finished reading Lapavitsas “Against the Troika”. Not a very good line of reasoning there. Anyway, I will send you a draft of an article I am writing about Greece. Should be ready by tomorrow. Would appreciate your comments. Yep a real clear and understandable post that even a “shade tree” economist can understand. It seems to me that both of these spokesmen for Greek Marxism are only shills for stagism, to one degree or another. This probably results from both coming out of the KKE and Stalinist tradition. The problem with stagism is that it logically results in a Marxist influenced government taking the side of capital AGAINST the workers, IF the bureaucracy has deemed the “stage” as not right for socialism. For proof of this you need only look to South Africa and the SACP’s support of the brutal repression of the platinum miners strike back a couple of years ago. And that reaction IS a logical reaction under these circumstances, IF you believe in the stagist theory of development.. The stagist theory doesn’t take into account the possibility and sometimes even the probability that the workers aspirations and consciousness can take quantum jumps in a very short time. Only Permanent Revolution will take this quantum leap into account. Finally, I go with Trotsky on this. I’m going to stand with workers rather than capital or the bureaucracy or any combination of the two. Marcus you couldnt be further from the truth on the stageism and KKE part. The KKE is actually not supporting Syriza because its “Marxism” is just Keynes covered with words, something that this article starts to uncover. If people want to be serious about Greek politics, dismissing KKE which comprises the vast percentage of the labour movement as “stalinists” of “another era”, will get you as radical as lapavitsas and varoufakis. It is of course no coincidence that many pictures that accompany the syriza related articles on jacobin are actually taken from KKE gatherings and demonstrations. Do you really want to understand the situation in Greece? Read KKE, thats a must, whether you agree with it or not. It will give you information that even if you dont agree with it, you will certainly benefit from its very detailed analysis. That is the labour movement. Lapavitsas is a former member of the SWP – UK and would be a bit surprised to learn he is of the ‘KKE and Stalinist tradition’…. Michael Roberts repeatedly refers to Greek capitalism’s lack of competitiveness, and capitalism is of course based on competition. And in any competition, there are winners but there are also necessarily losers. The capitalism of some country will inevitably be less competitive than others, and in the EU Greece for whatever reasons is one of those. The entire drive of the EU commanders is to make Greek capitalism more competitive through driving down living standards, which means increasing the surplus value extracted from the working class. If they succeed, then some other country would be less competitive, and then they would be forced to install similar measures. Varoufakis repeatedly claims he’s a Marxist, but that “Marxism” won’t work in the short term. That reminds me of the joke that nuclear fusion is the energy source of the future… and always will be. It also reminds me of Trotsky’s comment on workers’ leaders who reserve their socialism for holiday speechifying. It’s got no relevance for today. Or, to put it another way, they have no sense of the transitional method. I think this relates to maybe the most important point: The Tsipras/Varoufakis leadership seems not to base itself on a mobilization of the working class. I had that impression over a year ago on a completely different issue: the rise of Golden Dawn at that time. And whatever the issue, whether it be street thugs or nationalization of the banks, it cannot be resolved from above. But neither the present leadership nor the main left opposition seems to be committed to mobilizing the base. Are the ‘Great Marxists’ Costas is referring to Karl Kautsky and Rudolf Hilferding of the disastrous Wiemar bail-out c.1923 by any chance? Also I find the attempt to separate Marxist economics from the actuality (or potential at the very least) of revolution- which however Costas explains his rationale, he actually does, to be little different from the Eurocommunism of Tsipras and Varoufakis. Re ‘saving capitalism from itself’, wasn’t that the rather discredited project of Bernstein et al of the SPD/2nd International? I may quibble but throughout all of this I hear some disturbing echo’s from history. Is this not correct, at least for those wanting our focus to be on the productive sector, rather than financial? Syriza isn’t really interested in a jobs programme for Greek workers if it was it would apply rules of engagement ie less work, but work for all with no loss of pay. Lapavitsas is just Varoufakis Mk2, if the so called negotiations fail. Greece has had devaluations in wages and pensions the greatest out of all the EZ members. It has also had massive investments both internally and externally (one being the Olympics and the other being other Balkan countries). Compared to its neighbours in the industries that turn a buck it is ahead as it is a tourist based agricultural economy. But it cannot compete not because of a lack of competitiveness that is pure neo liberal garbage, but because it has no controls over capital product of labour flows whilst in the EU. Lapavitsas wants us to go back to the Drachma repay out debts a third time, not write them off, and allow the EU to dictate what is and isn’t produced. Up until the late 70s we had trade surpluses as far as I can recall. In 1980 Rhodes alone has more tourists than Turkey. Now we are geographically surrounded with Bulgaria, Turkey Albania all with national currencies. We cannot compete being in the strong Euro. The IMF economic genocide programme isn’t about competition but about creating one giant maquila to be in direct competition with Asia as a blueprint for the other peripheral EU countries. To serve the industrial code centre. We can no longer make any goods, shoes, garments etc when they are imported direct from Bangladesh. These so called academic marxists are there to manage declining capitalism and service the large transnational. The legal marxists of our time. They will be politically burnt when it becomes obvious there are never going to be new jobs on the horizon let alone in the next six months. “The legal marxists of our time”. Exactly. The silver lining would be that at least we have legal marxist economics to struggle against again! It is pretty clear that Syriza came into government without either a transitional program or a structured base in the Greek working class – likely KKE’s is stronger. One doesn’t have to be a trotskyist to realize what “transition” means here, and the experience of the USSR or PRC shows that no single state can negotiate the transition to socialism alone, certainly not a small state like Greece, and hence we are maximally talking about a transitional state. The perspective is that the Greek example would trigger similar processes in the EU, starting with Spain. But that would require revolutionary-minded leadership, even if this leadership led transitional reforms. And nationalizations, share out of work hours, etc., are transitional reforms, not “revolution”. So we are still playing defense, seeking the opening to begin reversing the permanent “neo-liberal” counterrevolution. That will never happen without determined revolutionary leadership, even in a defensive, non-revolutionary situation. VN Gelis says it’s “pure neoliberal garbage” that Greek capitalism cannot compete. He misses the point. The point is that capitalism is based on competition and in any competition somebody has to be a loser; somebody has to be less competitive. Any socialist worthy of the name starts not by considering whether one’s “own” capitalist class can compete with others, but by rejecting the very approach itself. The minute socialists, and the working class movement in general, accepts the idea of capitalist competition, we enter into a deadly death spiral, into the never ending “race to the bottom”. Or, look at it another way: There is no way that the Greek working class can stand up to the united power of the entire EU (including the Greek) capitalist class if they, the Greek workers, are alone and isolated. On the other hand, the struggle of the Greek working class can be used as a lever to build a region-wide and beyond united working class struggle. That is the alternative to “competitiveness”. Socialism is also based on competition. It is supposed to increase the productive forces not reduce them to rubble. All the hot air about the working class,Syriza and the EU is just a load of hot air. One starts from the concrete situation not the situation in one’s head whereby the world revolution will start from Oakland as its a globalised melting pot. Do we default now, go back to the Drachma and introduce currency or other controls or do we just waffle about the unity of the global working class whilst not even uniting our own around a concrete set of demands? Life is short and so is money. If we wait for Berlin’s workers to take power we are finished as evidence the 25k off suicides. Revolts occur where they occur they aren’t a simultaneous group exercise. This is a very good article! Too bad Lapavitsas and Baroyfakis from the greek word baroufa which means nonsense, as the rest of SYRIZA leadership have no intention of leaving the euro. They are well off and they will not jeopardize their money to save the poor greek people. They will sign a new bailout agreement and let their people suffer even more. They strongly believe that the EU is their home and family and many of them like Stathakis, another economist of disaster, believe that Greece must stay in the euro and the EU at any cost. I feel sorry for myself and my poor compatriots who voted for SYRIZA hoping that something will change. Indeed things will change to the worst. I am afraid that It will take a revolution for Greece to exit the euro and that is not in sight as even the so called greek Leftists or Marxists with the exception of KKE prefer capitalism and Keynes. But this is true for most of the so called Marxists in the western world. Greece needs to disengage from the euro and the EU, write off the debt and start nationalizing big business with joint public and workers control. This is the only way for the poor greek workers.